The domain within your query sequence starts at position 387 and ends at position 486; the E-value for the RA domain shown below is 2.08e-20. Ras proteins are signal-transducing GTPases that cycle between inactive GDP- bound and active GTP-bound forms. Ras is a prolific signalling molecule interacting with a spectrum of effector molecules and acting through more than one signalling pathway. 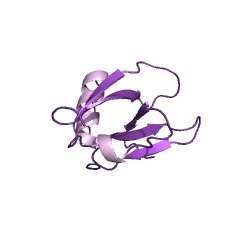 A domain of about 100 residues, termed RA for RalGDS/AF-6 or Ras-Associating, interacts with Ras and other small GTPases. It occurs in one or two copies in a variety of signalling molecules. It can be found associated with many other domains, such as PDZ, Dilute (DIL), GEF, myosin motor, IQ, C1, C2, protein kinase, VPS9 or sterile alpha motif (SAM) [(PUBMED:8987396), (PUBMED:11723130)]. Structurally, the RA domain of RalGDS consists of a five-stranded mixed beta- sheet interrupted by a 12 residue alpha-helix and two additional small alpha- helices. 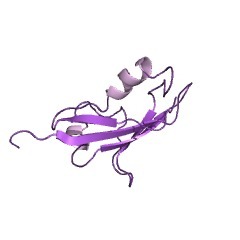 The structure of the RA domain belongs to the ubiquitin alpha/beta roll superfold and is similar to that of the RBD domain and the N-terminal third of the FERM domain [(PUBMED:9253406), (PUBMED:10334925)]. The RA domain forms a homodimer where the interdimer surface is composed of two cysteines (Cys 2 in each monomer) forming an intermolecular disulfide bond and two interacting intermolecular antiparallel beta-sheets [(PUBMED:9253406)]. The major interaction between Ras and RalGDS RA domain occurs between two antiparallel beta-strands: beta 2 of Ras and beta 2 of RA. This interaction occurs both at the backbone as well as the side chain level [(PUBMED:9628477)]. There are 20447 RA domains in 18300 proteins in SMART's nrdb database. Taxonomic distribution of proteins containing RA domain. This tree includes only several representative species. The complete taxonomic breakdown of all proteins with RA domain is also avaliable. Click on the protein counts, or double click on taxonomic names to display all proteins containing RA domain in the selected taxonomic class. Structural and biochemical analysis of Ras-effector signaling via RalGDS. 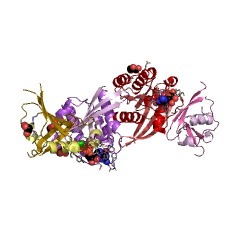 The structure of the complex of Ras with the Ras-binding domain of its effector RalGDS (RGS-RBD), the first genuine Ras-effector complex, has been solved by X-ray crystallography. As with the Rap-RafRBD complex (Nasser et al., 1995), the interaction is via an inter-protein beta-sheet between the switch I region of Ras and the second strand of the RGS-RBD sheet, but the details of the interactions in the interface are remarkably different. Mutational studies were performed to investigate the contribution of selected interface residues to the binding affinity. Gel filtration experiments show that the Ras x RGS-RBD complex is a monomer. The results are compared to a recently determined structure of a similar complex using a Ras mutant (Huang et al., 1998) and are discussed in relation to partial loss-of-function mutations and the specificity of Ras versus Rap binding. Identification of PLC210, a Caenorhabditis elegans phospholipase C, as a putative effector of Ras. Mammalian Ras proteins regulate multiple effectors including Raf, Ral guanine nucleotide dissociation stimulator (RalGDS), and phosphoinositide 3-kinase. In the nematode Caenorhabditis elegans, LIN-45 Raf has been identified by genetic analyses as an effector of LET-60 Ras. To search for other effectors in C. elegans, we performed a yeast two-hybrid screening for LET-60-binding proteins. The screening identified two cDNA clones encoding a phosphoinositide-specific phospholipase C (PI-PLC) with a predicted molecular mass of 210 kDa, designated PLC210. PLC210 possesses two additional functional domains unseen in any known PI-PLCs. 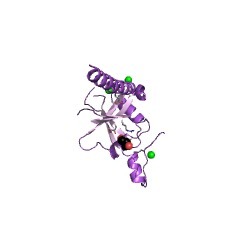 One is the C-terminal Ras-associating domain bearing a structural homology with those of RalGDS and AF-6. This domain, which could be narrowed down to 100 amino acid residues, associated in vitro with human Ha-Ras in a GTP-dependent manner and competed with yeast adenylyl cyclase for binding Ha-Ras. 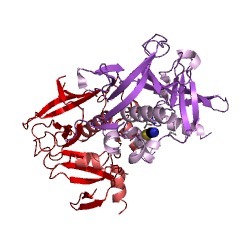 The binding was abolished by specific mutations within the effector region of Ha-Ras. 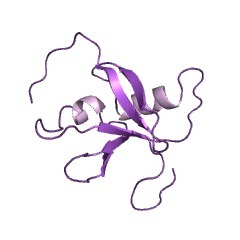 The other functional domain is the N-terminal CDC25-like domain, which possesses a structural homology to guanine nucleotide exchange proteins for Ras. These results strongly suggest that PLC210 belongs to a novel class of PI-PLC, which is a putative effector of Ras. Identification of Nore1 as a potential Ras effector. The small GTP-binding protein Ras is pivotal in transmitting growth and differentiation signals downstream of cell surface receptors. Many observations have indicated that Ras transmits signals from cell surface receptors into multiple pathways via direct interaction with different effectors in mammalian cells. We have identified a novel potential Ras effector or target named Nore1. Nore1 has no significant sequence similarity to known mammalian proteins and lacks an identifiable catalytic domain, but contains sequence motifs that predict DAG_PE binding and SH3 domain binding. We show that Nore1 directly interacts with Ras in vitro in a GTP-dependent manner, and the interaction requires an intact Ras effector domain. Nore1 becomes associated with Ras in situ following activation of epidermal growth factor receptor in COS-7 and in KB cells. 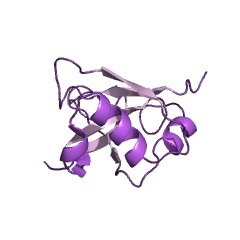 Kalirin, a cytosolic protein with spectrin-like and GDP/GTP exchange factor-like domains that interacts with peptidylglycine alpha-amidating monooxygenase, an integral membrane peptide-processing enzyme. Although the integral membrane proteins that catalyze steps in the biosynthesis of neuroendocrine peptides are known to contain routing information in their cytosolic domains, the proteins recognizing this routing information are not known. Using the yeast two-hybrid system, we previously identified P-CIP10 as a protein interacting with the cytosolic routing determinants of peptidylglycine alpha-amidating monooxygenase (PAM). P-CIP10 is a 217-kDa cytosolic protein with nine spectrin-like repeats and adjacent Dbl homology and pleckstrin homology domains typical of GDP/GTP exchange factors. In the adult rat, expression of P-CIP10 is most prevalent in the brain. Corticotrope tumor cells stably expressing P-CIP10 and PAM produce longer and more highly branched neuritic processes than nontransfected cells or cells expressing only PAM. The turnover of newly synthesized PAM is accelerated in cells co-expressing P-CIP10. P-CIP10 binds to selected members of the Rho subfamily of small GTP binding proteins (Rac1, but not RhoA or Cdc42). 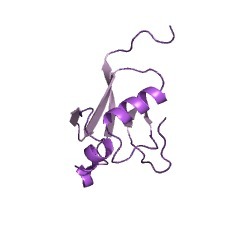 P-CIP10 (kalirin), a member of the Dbl family of proteins, may serve as part of a signal transduction system linking the catalytic domains of PAM in the lumen of the secretory pathway to cytosolic factors regulating the cytoskeleton and signal transduction pathways. Three-dimensional structure of the Ras-interacting domain of RalGDS. The Ras-interacting domains of the the protein-kinase Raf and the Ral guanine nucleotide dissociation stimulator, RalGDS, lack extensive sequence similarity, but their overall three-dimensional structures are very similar to each other. Mutational analysis indicated that three residues in the RalGDS domain are critical for its interaction with Ras. Quantitative structure-activity analysis correlating Ras/Raf interaction in vitro to Raf activation in vivo. 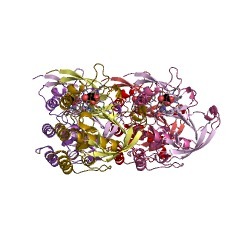 Binding of Ras to c-Raf-1 is a pivotal step of many mitogenic signalling pathways. 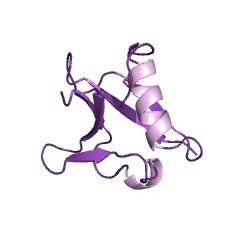 Based on the recent crystal structure of the complex of Rap1A with the Ras-binding domain of Raf, mutations were introduced in c-Raf-1 and their effects on Ras/Raf binding affinity in vitro and Ras/Raf regulated gene expression in vivo were analysed. Our data reveal an empirical semilogarithmic correlation between dissociation constants and Raf-induced gene activity. 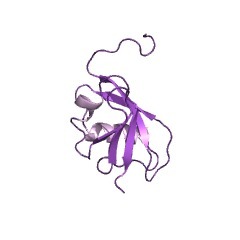 The functional epitope that primarily determines binding affinity consists of residues Gln 66, Lys 84 and Arg 89 in Raf. This quantitative structure-activity investigation may provide a general approach to correlate structure-guided biochemical analysis with biological function of protein-protein interactions. Identification of AF-6 and canoe as putative targets for Ras. Ras (Ha-Ras, Ki-Ras, N-Ras) is implicated in the regulation of various cell functions such as gene expression and cell proliferation downstream from specific extracellular signals. Here, we partially purified a Ras-interacting protein with molecular mass of about 180 kDa (p180) from bovine brain membrane extract by glutathione S-transferase (GST)-Ha-Ras affinity column chromatography. 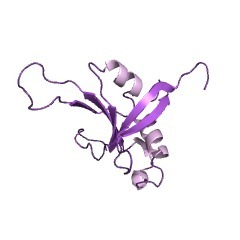 This protein bound to the GTP gamma S (guanosine 5'-(3-O-thio)triphosphate, a nonhydrolyzable GTP analog).GST-Ha-Ras affinity column but not to those containing GDP.GST-Ha-Ras or GTP gamma S.GST-Ha-Ras with a mutation in the effector domain (Ha-RasA38). 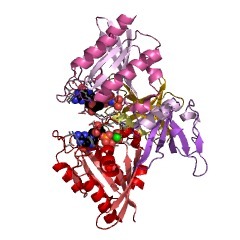 The amino acid sequences of the peptides derived from p180 were almost identical to those of human AF-6 that is identified as the fusion partner of the ALL-1 protein. 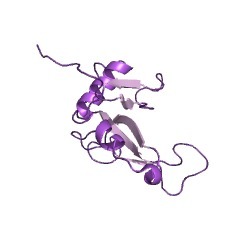 The ALL-1/AF-6 chimeric protein is the critical product of the t (6:11) abnormality associated with some human leukemia. AF-6 has a GLGF/Dlg homology repeat (DHR) motif and shows a high degree of sequence similarity with Drosophila Canoe, which is assumed to function downstream from Notch in a common developmental pathway. The recombinant N-terminal domain of AF-6 and Canoe specifically interacted with GTP gamma S.GST-Ha-Ras. The known Ras target c-Raf-1 inhibited the interaction of AF-6 with GTP gamma S.GST-Ha-Ras. These results indicate that AF-6 and Canoe are putative targets for Ras. A novel family of Ras-binding domains. 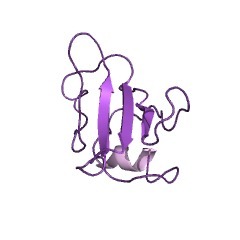 The structure of rat ADP-ribosylation factor-1 (ARF-1) complexed to GDP determined from two different crystal forms. 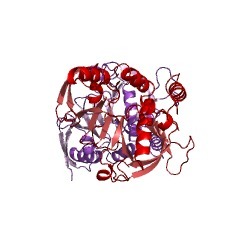 The ARFs are a family of 21,000 M(r) proteins with biological roles in constitutive secretion and activation of phospholipase D. The structure of ARF-1 complexed to GDP determined from two crystal forms reveals a topology that is similar to that of the protein p21 ras with two differences: an additional amino-terminal helix and an extra beta-strand. The Mg2+ ion in ARF-1 displays a five-coordination sphere; this feature is not seen in p21 ras, due to a shift in the relative position of the DXXG motif between the two proteins. 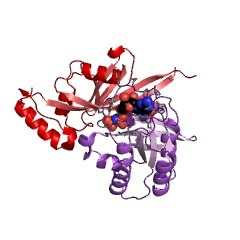 The occurrence of a dimer in one crystal form suggests that ARF-1 may dimerize during its biological function. The dimer interface involves a region of the ARF-1 molecule that is analogous to the effector domain in p21 ras and may mediate interactions with its effectors. The 2.2 A crystal structure of the Ras-binding domain of the serine/threonine kinase c-Raf1 in complex with Rap1A and a GTP analogue. 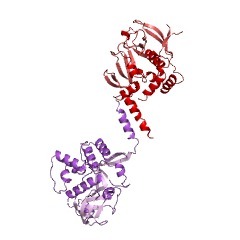 The X-ray crystal structure of the complex between the Ras-related protein Rap1A in the GTP-analogue (GppNHp) form and the Ras-binding domain (RBD) of the Ras effector molecule c-Raf1, a Ser/Thr-specific protein kinase, has been solved to a resolution of 2.2 A. 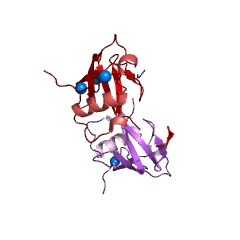 It shows that RBD has the ubiquitin superfold and that the structure of Rap1A is very similar to that of Ras. 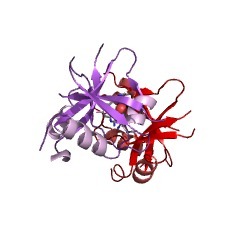 The interaction between the two proteins is mediated by an apparent central antiparallel beta-sheet formed by strands B1-B2 from RBD and strands beta 2-beta 3 from Rap1A. Complex formation is mediated by main-chain and side-chain interactions of the so-called effector residues in the switch I region of Rap1A. How Ras works: structure of a Rap-Raf complex. 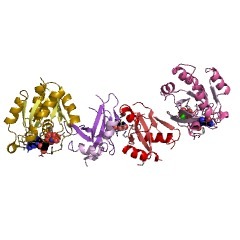 The three-dimensional structure of the complex between Rap and the 'Ras-binding domain' of Raf could be the prototype for a G protein-effector interaction. Activated Ras interacts with the Ral guanine nucleotide dissociation stimulator. 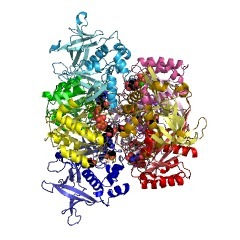 The yeast two-hybrid system was used to identify proteins that interact with Ras. The H-Ras protein was found to interact with a guanine nucleotide dissociation stimulator (GDS) that has been previously shown to regulate guanine nucleotide exchange on another member of the Ras protein family, Ral. The interaction is mediated by the C-terminal, noncatalytic segment of the RalGDS and can be detected both in vivo, using the two-hybrid system, and in vitro, with purified recombinant proteins. The interaction of the RalGDS C-terminal segment with Ras is specific, dependent on activation of Ras by GTP, and blocked by a mutation that affects Ras effector function. These characteristics are similar to those previously demonstrated for the interaction between Ras and its putative effector, Raf, suggesting that the RalGDS may also be a Ras effector. Consistent with this idea, the RalGDS was found to inhibit the binding of Raf to Ras. Structure of the guanine-nucleotide-binding domain of the Ha-ras oncogene product p21 in the triphosphate conformation. 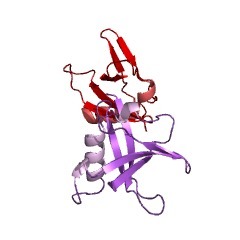 The crystal structure of the guanine-nucleotide-binding domain of p21 (amino acids 1-166) complexed to the guanosine triphosphate analogue guanosine-5'-(beta, gamma-imido)triphosphate (GppNp) has been determined at a resolution of 2.6 A. The topological order of secondary structure elements is the same as that of the guanine-nucleotide-binding domain of bacterial elongation factor EF-Tu. 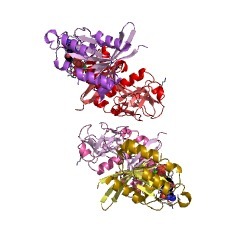 Many interactions between nucleotide and protein have been identified. The effects of point mutations and the conservation of amino-acid sequence in the guanine-nucleotide-binding proteins are discussed. This information is based on mapping of SMART genomic protein database to KEGG orthologous groups. Percentage points are related to the number of proteins with RA domain which could be assigned to a KEGG orthologous group, and not all proteins containing RA domain. Please note that proteins can be included in multiple pathways, ie. the numbers above will not always add up to 100%.